The imposing brass bound ebonycase has an inverted bell top and five brass flambeau finials standing on brass reeded ebony plinths. 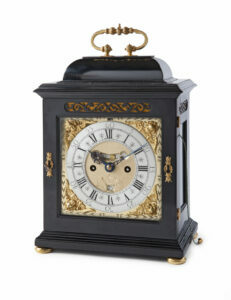 It has baluster drop carrying handles to the sides and brass capped stop-fluted pilasters to the front and rear doors. 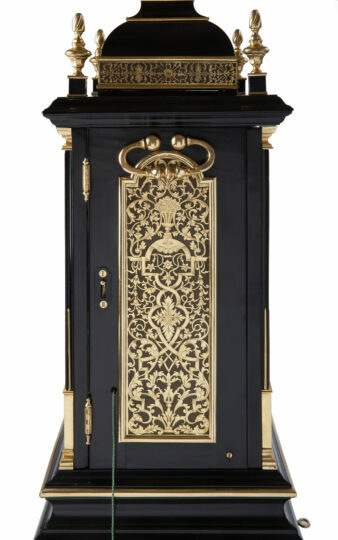 Its turntable plinth stands on gold lacquered brass block feet. 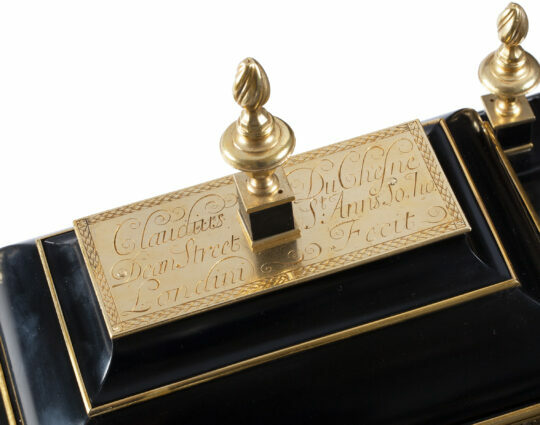 The bell top covered with a sumptuously engraved gold lacquered brass top plate with the makers name and address: Claudius Duschesne Dean Street St Anns So’ho Londini Fecit. The dominant decorative feature of the case are undoubtedly the exquisite gold lacquered brass sound frets which can be found as gallery frets around the bell top and to the sides of the case. 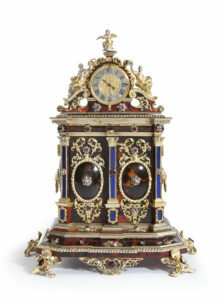 These are finely fretted and beautifully engraved with foliate scrols and floral baskets. • The 8¼” x 12″ break arch dial with three winding holes has a finely matted center and a date aperture above VI and blued steel finely cut hands. 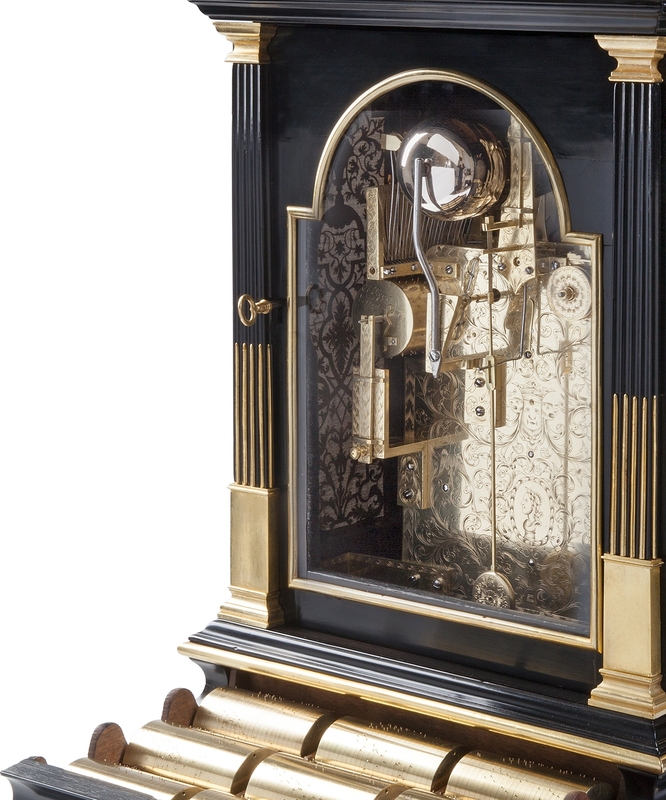 There is a mock pendulum aperture below XII showing the maker’s name on its engraved and silvered background plaque. The silvered brass chapter ring is engraved with Roman numerals, fleur-de-lys style half hour markers, Arabic at the outer five minute marks and diamond half quarter markers. 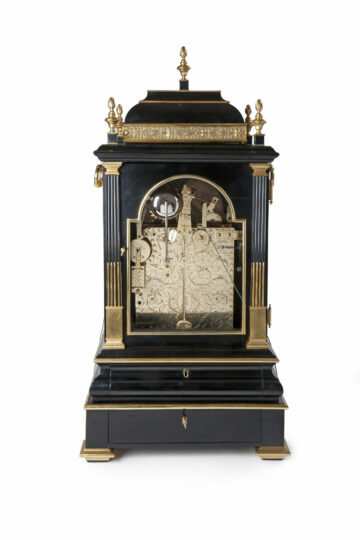 It bears the makers signature Claudius Duchesne Londini at VI. 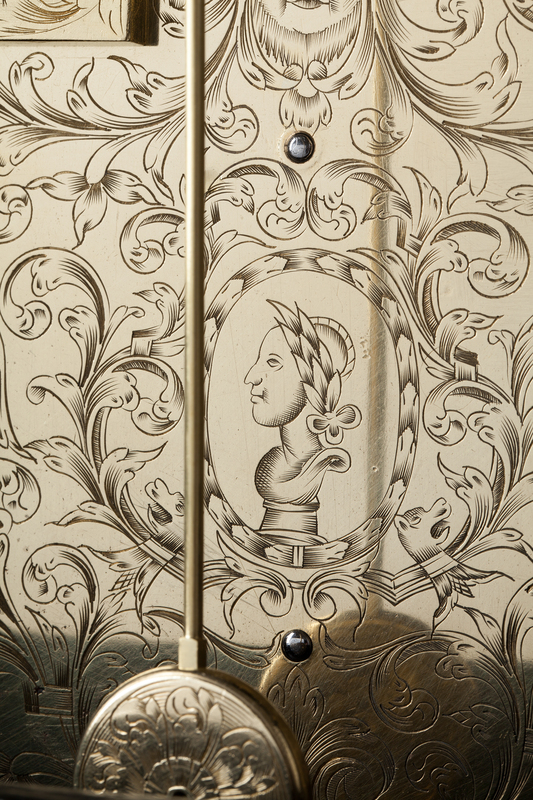 There are four finely embossed mask and foliate designed spandrels, the bottom ones with a Chronos mask and the upper ones with a Diana mask. 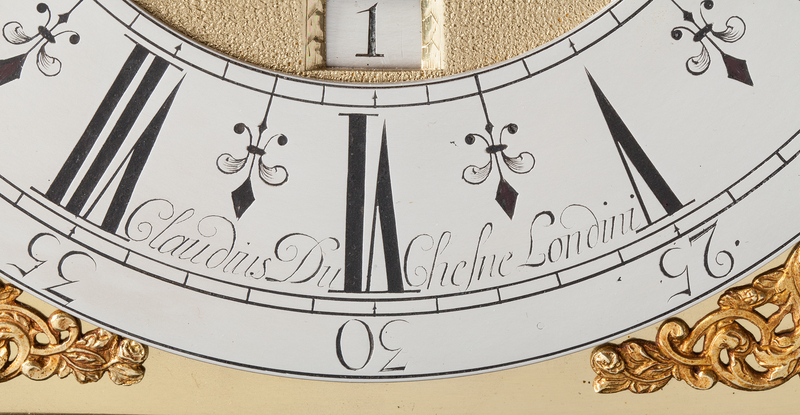 The finely foliate engraved arch with Strike No Strike (SN) setting, apertures for moonphase and moon age -recorded in 59 half moon days- and the following subsidiary dials with their blued steel faceted pointers:Rise and fall regulation, Days of the week -in French- and their symbols. Months of the year -in French- with their relevant number of days. 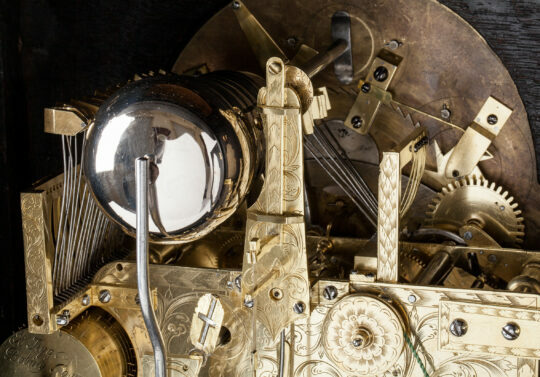 The substantial eight day movement with eight knobbed pillars, triple gut fusees and verge escapement with a spring suspended pendulum and rise and fall regulation through a foliate engraved snail. Pull-quarter and hour repeat chiming on six bells via a small ⅞” cylinder and rack and snail hour strike on a further bell. The backplate profusely engraved with a wheat ear framed symmetrical scrolling foliage inhabited with two birds flanking beneath a central grotesque mask and an oval wheat ear framed Apollo mask. The two tunes on each cylinder are selectable through a setting lever at the side of the case. • About the maker. The Revocation of the Edict of Nantes by Louis XIV in 1685 caused a massive influx of Huguenot emigrants from France into England. As a religiously tolerant country, with pre-existing Huguenot communities, England was a natural sanctuary for those fleeing persecution in France. It is estimated that by 1700 the Huguenot population in the London area alone numbered between 20,000 and 25,000. Claude Duchesne was one of those who left Paris to start a new life in London. He was made a Free Brother in the Clockmakers’ Company in 1693 and lived in Long Acre in the parish of St Anne’s, in Soho. 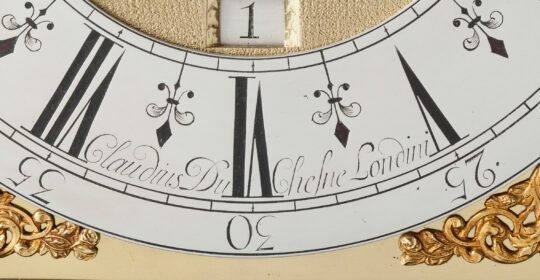 Duchesne is thought to have lived until about 1730, his son Antoine became freeman in the Goldsmiths’ Company. 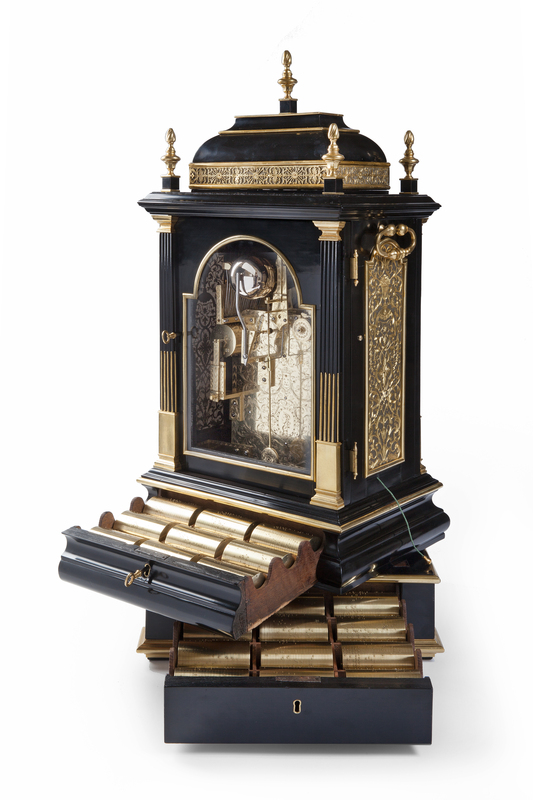 Claude Duchesne is noted for making musical and complicated clocks; a pair of silver-mounted ebony musical bracket clocks with interchangeable musical cylinders exist in the Rosenborg Castle, Copenhagen. 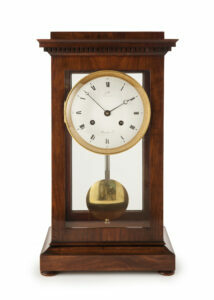 He took on Richard Bullock as an apprentice in 1715, although he no doubt retained others. In 1718 he was excused stewardship ….because he has five children and pleads inability. 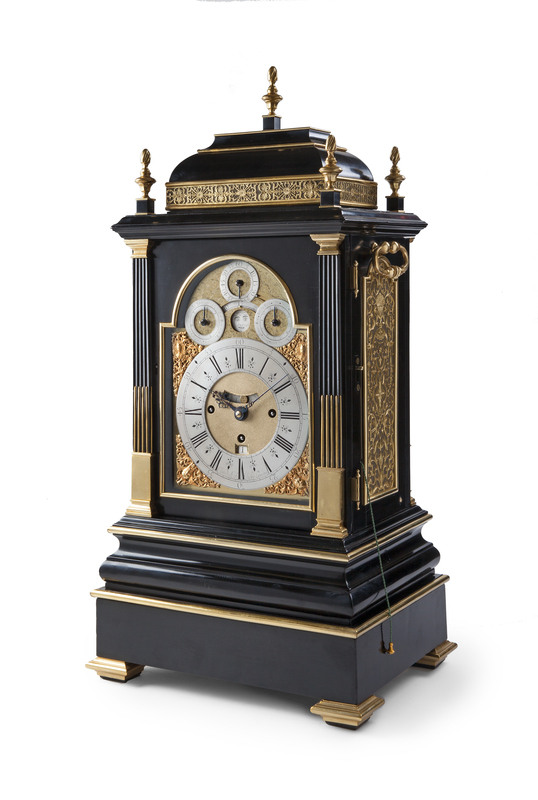 The profilic Duchesne family was established simultaneously in the major clock making centers of London, Paris, Amsterdam and Geneva. Dimensions: H. 32” W. 15¼” D. 11½” (81×38,5×29 cm.) Height including top finial.